Bing Puddlepot has been penning adventures all his life, winning his first blue ribbon for a book he wrote and illustrated in third grade called William the Wise Weasel. An American born and raised in Japan who now makes his home in Minnesota, Bing’s stories have a whimsy and sense of adventure that connect with children. “Kids like to be amazed and amused. So for me, it’s their wide eyes and laughter that makes storytelling so much fun,” he explains. Bing believes that kids are smart sponges of life, and that learning is a by-product of adventure. These concepts are reflected in Bing’s children’s book, Jimmy Jonny Brownie Stays Up All Night. His middle grade writing and more info can be found at www.Jonathan-Bing.com. Bing’s good friend Sherwin Schwartzrock grew up herding goats during the summer in rural Minnesota, often taking along a sketchbook for doodles. At the age of 13, his job became his inspiration for Clyde Quackgrass, a comic strip character that was picked up by 11 community newspapers. Sherwin has since given up goat herding and is currently an illustrator and designer in Minneapolis. His work can be found at www.schwartzrock.com. Corey began piano lessons at age 8 and composing music at age 16. He has written a wide variety of music for actors, dancers, musicians and especially listeners. He currently teaches piano lessons and composes from his home in Minneapolis. If you’d like to get a hold of Bing Puddlepot, use the form below and we’ll get back to you shortly. 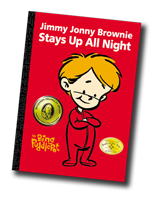 You can order Jimmy Jonny Brownie Stays Up All Night today through Amazon. Yes, the book that launched a thousand sweet dreams is available at Amazon and other bookstores. I'll take one! This book bested hundreds of other books for this national independent publisher’s award. Foreword Magazine gave this book its highest honor. Selected to be reprinted in a special once-a-year Kids section of The Baltimore Sun. © Bing Puddlepot, LLC. All rights reserved.